Nordic Walking is the perfect way to stay happy and healthy during pregnancy! Prior to finding out that I was expecting I was in very good shape. Fitness and endurance sports have seemed to run in my blood. At the age of 10 my father had me on a training plan for running; the following year I was competing in Junior Nationals. I was a Division One cross-country skier in college, have ski raced internationally and run multiple marathons. In my early 20’s it was not a rare thing to see me putting in 2-3 runs or skis. As I started to focus more on my career and coaching I found I had less time to put into my own workouts but still wanted to maintain good physical fitness. My runs became shorter but more intense and I discovered the power of HIIT and interval workouts with weight. My day usually consisted of a morning strength and or HIIT routine followed by a run after work. Sometimes, one a good day, I was even able to get in another strength workout. Needless to say, working out was part of my life. It was a great stress reliever, provided me with much needed “me time”, allowed me to maintain a healthy weight, got me outside and made me happy (hello endorphins!). So when I found out I was pregnant I was determined to keep up my fitness routine not only for my sanity and health but for the health of my pregnancy and baby as well. The only change I made at first to my fitness routine was decreasing the weight during my strength workouts. I did this for two reasons, one being that I found I was battling some fatigue and with smaller weights, I was able to finish the workout strong instead of collapsing halfway through out of exhaustion. Two, the research out there recommends lighter weights but more reps so as not to overload muscles and joints. More information on this research can be found here: (http://www.babycenter.com/404_is-it-safe-to-lift-weights-during-pregnancy_4345.bc). I still kept up my miles as well. The first weekend I found out that I was pregnant, my husband and I had a camping trip planned to Pictured Rocks National Lakeshore. We had been talking about this trip for years and we finally had the time to make it happen, and I was not going to let pregnancy hold me back. Normally when we go on trips we are very active and love to explore the new terrain and scenery by running biking, paddleboarding and or skiing. This trip was not going to be any different. Being early in my pregnancy I was able to keep up with my husband and work through our itinerary which included a 10 mile run along the cliffs at Pictured Rocks and two amazing (but brutal) paddles on Lake Superior. I felt like this pregnancy thing was going to be a breeze. Fast forward a few weeks to the middle of my first trimester. Morning sickness! Not really sure why they call it morning sickness when it lasts all day, every day! Morning sickness threw me off my game. Not only could I not eat the normal healthful foods I eat on a regular basis but I also couldn’t work up the energy to workout. Plus the bouncing motion of running and strength training had me running for the bathroom. When I did feel well enough to get out for a run, I usually ended up stopping part way because I would begin to feel faint and dizzy. I will admit, I sulked for a few days. I was bumming hard that I was not able to be active and eat healthy. The images in my head of being that fit pregnant lady seemed to be shattered. However, in my desperate attempts to find anything to help ease or manage my nausea I found Nordic Walking. Walking and being outside helped to give me some sort of relief from the nausea. Adding the poles to my daily walk also allowed me to enhance my workouts and make up for the strength training I was missing out on. Nordic walking has all the positive benefits of walking with weights but none of the negatives (high impact). Nordic Walking, which burns 40% more calories than regular walking, has also helped me to maintain a healthy weight during pregnancy. With the poles, I am able to walk up to 6 miles a day. Because of Nordic Walking, I am keeping up my endurance, fitness level, and my sanity. Nordic Walking poles will be my friend throughout this entire pregnancy. As my belly grows and the extra pounds start to add up, the poles should offer increased stability and ease to my joints. This winter, when the roads get snow covered and icy the poles will offer stability. The poles should make my walking routine a bit safer for me and baby. 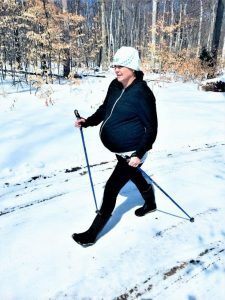 Nordic Walking can be a safe and effective workout for pregnant women but just like with all new workout routines you should consult your physician before starting.